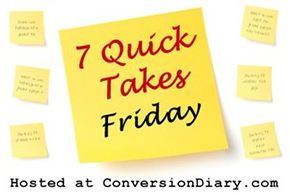 It’s 7QT Friday with Jennifer over at ConversionDiary.com! I’m excited to share with you an interview with R. B. O’Gorman, nice Irish Catholic doctor that he is… sorry, ladies–he’s taken! His novel Fatal Rhythm just dropped, and it has so many good readers saying so many good things about it, I just scooted it up to the top of my dance card. I met him at CMN/CWG back in August, so allow me to introduce you! R. B. O’Gorman grew up in Texas where he developed a devotion to Our Lady of Guadalupe. He obtained a PhD in Biochemistry from Rice University and studied cardiovascular surgery under Dr. Michael E. DeBakey. His debut novel, FATAL RHYTHM, is a medical suspense/mystery based on his training experience. Currently, he lives in Mobile, Alabama, where he writes, teaches, and practices medicine. He and his wife stay busy with their six children and first three grandchildren. Tell us about your most recent work. How did the idea come to you? How long did it take you from start to publication? The annual celebration of Our Lady of Guadalupe begins with Las Mananitas, and my experience at St. Anne’s Church in Houston touched my soul. I felt compelled to translate that experience into words. Some two decades later, Fatal Rhythm was published. Idea, research, editing, design…What was your favorite part of working on this project? What was your least favorite? The favorite part was the initial writing. I even enjoyed the editing experience. My least favorite was negotiating the publication process. Tell us about how this work came to reach us: did you go the self-publishing route or did you contract with a publisher? What was that like? I was listening to “The Son Rise Morning Show” on EWTN and heard about a new Catholic publisher who was sponsoring a contest. That prompted me to take down the novel from the proverbial shelf and submit. I was a finalist in that contest and was offered a contract. Ultimately, I did not publish with that entity, but the external confirmation of the book’s worthiness was invaluable. What other things in your life do you juggle in order to keep at your writing? How’s that working out for you? It is always a juggle. I work as a cardiovascular surgeon, I’m married, and we have six children and three grandchildren. It is hard to resist the temptation to “do it all,” and I’m blessed that my wife lets me slide on some of my jobs (the yard, the garage) when I’m particularly focused on a writing project. Setting, characters, plot, mood, tone… What would you describe as your greatest strength as a writer? I think my greatest strength is in mood/tone. I hope I have a compelling plot and believable characters, but if my work doesn’t convey my chosen themes, it has no value. Conversely, if you could change one thing about your writing style, what would it be and why? I wish I could write faster. Lastly, where can we find your work, a. k. a. give you our hard earned cash? FATAL RHYTHM is available through Amazon.com and BarnesandNoble.com in both digital and trade paperback. Thanks, Ron! Readers, have you picked up Fatal Rhythm yet?